Till now, we have fixed shaped battery design which sometimes very annoying when we have technology advancement in various fields. As technologies progress and multiply and even become steeped within one another, like 3D printing and electrical components, it makes perfect sense that batteries could be 3D printed right into innovative products busy coming down the line today like 3D printed wearables, various displays, and virtual reality pieces. Researchers have created printable solid-state batteries that can be printed in any conceivable shape and can be seamlessly embedded into a variety of surfaces. 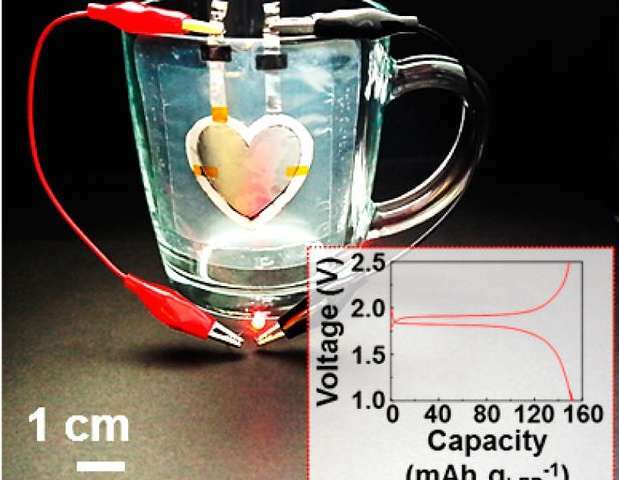 To demonstrate the technology, the scientists printed a working heart-shaped battery onto a cup, another onto a paper eyeglass and even one in the form of the letters "PRISS", all of which were capable of powering LEDs. A team of researchers at Ulsan National Institute of Science and Technology (UNIST), led by Prof. Sang-Young Lee have discovered a new class of printable solid-state Lithium-ion batteries (as referred as PRISS Batteries) that can exist on almost any surface. According to the research team, conventional rechargeable batteries come in fixed shapes and sizes, which have intrinsic limitations in fulfilling design and performance requirements for the flexible and wearable electronic devices. However, unlike traditional battery technologies, PRISS batteries use paste-type electrolyte cells and the electrodes of a slurry, which can be printed on to the surface of almost any objects. Prof. Lee states, "All battery components, such as cathodes, anodes and electrolytes, can be printed on arbitrary objects of complex geometries, thereby enabling the seamless integration of shape-conformable solid-state rechargeable batteries with various form factors into complex-shaped objects." He continues by saying, "We envision that the printable battery presented herein holds a great deal of promise for potential use in forthcoming wearable electronics and IoTs (Internet of Things), which eventually removes pre-designated battery space with fixed dimension and shape."